Bring the big screen to your own home with a custom-installed home cinema system. Whether you are looking to add some cinematic excitement to your existing living room, or develop a spare room into a dedicated home cinema space, we can help. How does a home cinema system work? Imagine everything you love about a trip to the movies, without having to leave the front door. Starting with the screen, home cinema relies upon a white screen and a projector – much like those you would find in a movie theatre. We can help you select the best system for your chosen space and set it up so that the image is crystal-clear, focused and sharp. With years of experience to our name, we are happy to advise on the best position to avoid annoyances such as glare and sunlight too, so that you really can get the very best cinematic experience possible. Moving on to the sound, modern home cinema systems use the same technology as commercial movie theatres. You can expect to be blown away by sound effects that fill your living room, encapsulating you in the drama you are watching on screen. With Dolby ATMOS and 3D audio in your home, you may never feel the need to go to the cinema again. How big a space do I need for my home cinema? The advanced home cinema technology available today means that pretty much anyone can have a home cinema system, and you are no longer bound by the restrictive size of your living space. 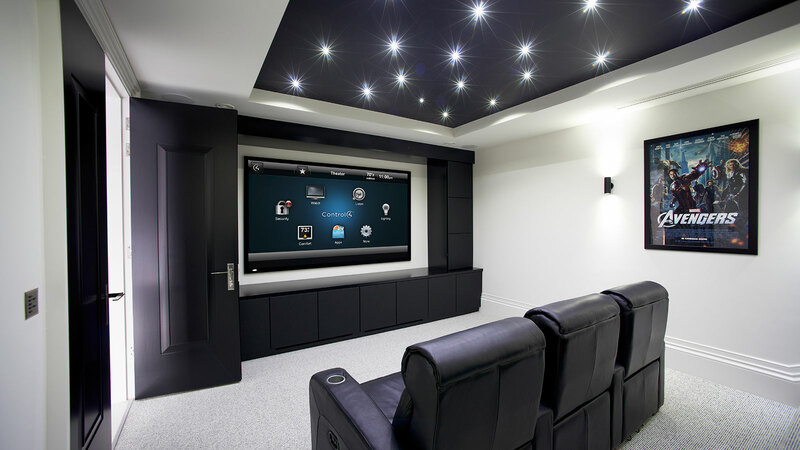 The size and shape of your room is of course a factor, but we are here to advise on what’s possible and can suggest the best solutions from the wide range of home cinema products we install. Simply speak to us about what you would like and let us do the rest. There’s no precise answer to that as prices can range quite dramatically – it really depends on a number of factors, from the size and model of screen you select, to the type of sound system that accompanies it and whether you would like any additional features. Most people are surprised to find though, that installing a home cinema is not necessarily as expensive as they had imagined. If you would like a home cinema system but are not sure if your budget can stretch to it, just let us know what you would like to spend and see what we suggest.